The F-Type was the car that changed everything for Jaguar. It was Jag’s first proper sports car in more than 50 years, a statement of intent and just the kind of catnip needed to get buyers in the big foreign markets investing in the British-Indian brand again – and the figures show it's been a success. Twelve months since the chic convertible's launch, Jaguar is now the fastest-growing premium brand in the world, with sales of more than 77,000 last year, an increase of 42 percent. Jaguar set sales records in 17 markets in 2013, including some big ones in India and China. Every model in the range is feeling the warmth of the F-Type halo, with even the XJ recording its biggest sales in a decade. You can understand the excitement within the company, then, about the fact that the coupe version of the F-Type has finally arrived, after being launched to the world with The British Villains TV commercial during the Super Bowl, when the "It's good to be bad" slogan was seen by 100 million people. Another 11 million have since streamed it on YouTube. If the growth that the roofless F-Type delivered was powerful, the Coupe should be huge as Jaguar claims it effectively doubles its accessible markets – coupes far outsell convertibles when it comes to the sports car segment. Despite that, Jaguar expects the Coupe to make up just 60 percent of F-Type sales, with America, the UK and Germany the biggest markets. Unlike the inexplicably priced Porsche Cayman, which somehow manages to be more expensive than the Boxster on which it's based, the Coupe will be cheaper than the roadster, by almost $20,000 in the case of the base supercharged 3.0-litre V6 model at $119,900. That buys you 250kW, 450Nm and a 0-to-100km/h dash of 5.3 seconds, which is 0.3sec slower than a new Golf R.
A higher tune of the V6 is available in the $152,300 S Coupe, with 280Kw/460Nm for a 4.9sec sprint. It offers a top speed of 275km/h. That is short of the range-topping R Coupe's supercar-serious 300km/h top whack. The snorting supercharged 5.0-litre V8 makes a roaring 405kW and 680Nm, as well as some serious noise, and can hurl it to 100km/h in 4.2sec. The R Coupe will set you back a significant $219,600, which is $17,655 more than the fastest F-Type roadster, the V8 S, but you do get an extra 40kW and 55Nm for the money. It also makes the R just $7150 more than a base 911 Carrera (which offers a comparatively meagre 257kW and 390Nm, line-ball with the base F Type Coupe). Stealing sales off Porsche – and BMW, Benz and Audi – is what this car is all about. The roadster has already achieved a 75 percent conquest rate – buyers who have been dragged out of other brands and never owned a Jag before – but the Coupe's figure is tipped to be as high as 90 percent. The Coupe launch was held in a particularly soggy part of Spain yesterday, at the Motorworld race track, and we can therefore report that it is very difficult and exciting to drive in slippery conditions. We were given the R Coupe to drive flat-out on the 5.3km circuit, but flat-out wasn't really an option, unless that's how you preferred your body to spend the rest of eternity. The torque delivery of the new F Type is so savage that just the slightest provocation of the throttle, even in its least-sensitive setting, was enough to send the big Jag savagely sideways. We can, at least, report that the traction control's limits are very generous indeed, or perhaps it was just so wet that the system was entirely overwhelmed. A slightly scary road drive in the V6 base model revealed that the Coupe is, as you would expect, much stiffer and consequently sharper and more fun to drive than the roadster. And the problem that saw the F-Type knocked out of last year's COTY in the first round – the complete absence of any kind of boot space – has been solved with the Coupe. The rear, hatch-style storage isn't exactly capacious, but comparatively speaking it's a bucket next to the roadster's thimble. On the downside, Jaguar may have gone too far with the inherent stiffness of the new model because it displayed a crashy, bouncy ride over some jarring roads. The glorious noise of both the V6 and V8 engines, particularly at high revs and on the overrun, is still an absolute highlight, even with the addition of a solid roof. It also seems safe to say that the Coupe should live up to Jaguar's claims of it being the most focused and sporty car the company has ever built. 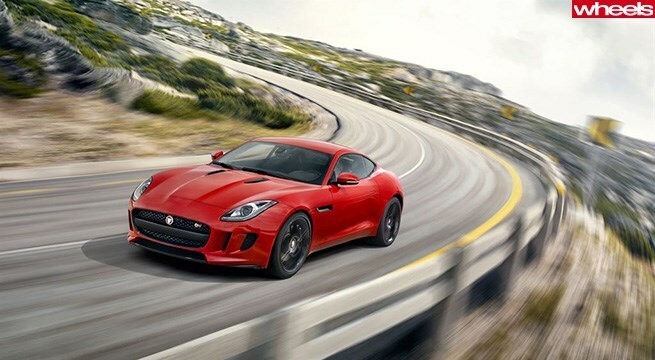 The F-Type Jaguar remains a very fine car, but the Coupe is undoubtedly an even better one.